Even though it has “cream” in the name, maple cream is 100% pure Vermont maple syrup and does not contain any dairy products. 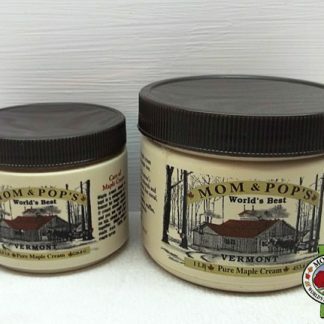 Maple cream is maple syrup that has been cooked to the soft-ball stage, cooled, and then stirred until it turns into a fine, smooth spread with a pale color. Save on shipping costs! Remember to order enough for that special breakfast at Thanksgiving or Christmas. Makes a great icing on sticky buns, toast, biscuits, cake and much else. 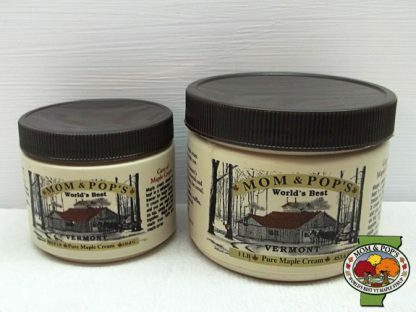 Maple cream should be kept in the refrigerator or freezer ASAP after purchase. It can also be kept in the freezer for a lifetime plus 1 day. In the freezer, the maple cream will be firmer, but will not freeze. We were in Vermont on vacation, and happened upon your stand at Moss Glen Falls. What a lucky find! We tasted all the grades, and took a brochure. During the remainder of our vacation, we price-compared to all the other places that carry maple syrup and other maple products, including a famous maple farm. Believe me, that’s a lot of places! Your prices were the best by far! What can I say about your maple cream except that it’s incredible!! We weren’t familiar with maple cream, but now can’t get enough of it. We’ve gifted several friends with maple cream, and they have all raved about it. It’s fantastic on toast, biscuits, cinnamon rolls, and even straight out of the jar. Treat yourself to this wonderful product! !